This photograph does not do this dish justice. We (ok, so mostly me) were so eager to dig in that we forgot to take a photo until we finished eating and this was all that was left. I’m surprised there was any left at all! In contrast to the heart healthy meal below, here is one that is cholesterol laden. Do you suppose if you put enough garlic in the dish it would counteract all that butter and crab? No matter, it was finger lickin’ good! The original recipe, which called for 40 cloves of garlic and a pound of melted butter, just seemed too daunting even for me. So I altered the proportions a bit. I think they may have meant to use the Maryland type blue crabs, but all I can get my hands on is the pre-cooked dungeness crabs at Costco, which I would normally turn my nose up on. But hey, when you have a craving you find a way. Actually, these weren’t too bad. Well, they weren’t unpleasant, put it that way. If you notice, I also omitted some of the other ingredients like chopped onions, celery and bell pepper. I just wanted the pureness of crabs and garlic and BUTTER. Break up the crab into pieces, cracking the legs and place in an oven safe dish. In a saucepan over medium low heat, melt the butter with the olive oil and sautee the garlic until fragrant and tender. Add the bayleaves, parsley, sauces and salt and pepper. Stir to blend and pour over the crabs. Bake in a 400 degree oven just until the crabs are warmed through, about 15 to 20 minutes. holymoly! 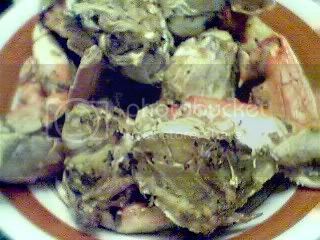 i just posted a crab recipe and here’s another one with garlic, moi favorito mucho! Hi Obachan! Yeah, definitely a weekend meal. Not only because of the garlicky aroma, but you probably need a whole day to recover from the cholesterol overload. lol! 40 cloves of garlic and a pound of melted butter!!?? ?….the garlic I can handle, the butter maybe not. Thanks for putting up the link to this recipe, I’ve been wanting to try crab-based dishes lately! sana kapitbahay tayo! Sarap naman nito, garlic fanatic ka rin ba? Wow! :O I think the original recipe definitely has to be a weekend meal.